California & Hawaii Foliage Growers INC is a wholesale foliage nursery, located in Papaikou, Hawaii. Our mission is to redefine foliage quality standards in the professional interiorscape industry nationwide. Grown exclusively on the Big Island of Hawaii by California and hawaii foliage Growers Inc. The true Dracaena Lisa™ is easily recognized by her deep green foliage, long slender leaves, and uniquely full bouquet look. Lisa's™ longevity in any application makes her one of the most sought after interiorscape plants available. 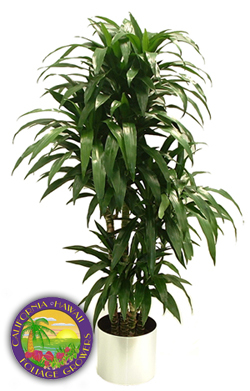 Dracaena Lisa™ requires minimal light and watering and is available in an assortment of sizes from 42" to 84". Dracaena Michiko™ created by California and Hawaii Foliage Growers Inc, in the tropical paradise of Hawaii, this patented hybrid dracaena has been around for over two decades. Dracaena Michiko's™ thick green, slightly curled leaves gives her a truly distinctive and unique appearance, unlike any other Dracaena available today. Michiko™ is avaiable in upright multi-staggered tips, or cutback multi-tips for a fuller multi-headed look.